Are you trying to eat less carbs and incorporate more green vegetables into your diet? This is an awesome goal because your body craves fresh fruits and vegetables in comparison to the other types of foods you eat. In fact, fresh vegetables and fruits can actually help you eliminate the cravings for the bad foods. One way to make this goal a reality is to start making small changes at a time. Since starches are an addiction for most of us and especially pasta dishes, here is one way to eat less carbs while still enjoying the same types of delicious meals that you love. Invest in a good spiralizer and start making noodles of vegetables. Zucchini noodles are the most popular pasta replacement, but you can also use other squashes, carrots, cucumbers, celery, cabbage, 0etc., depending on the dish you are planning to make. For example, you can make spaghetti squash noodles for red sauce recipes or use cucumbers in cold pasta salads; they actually make a delicious replacement for regular noodles. Since zucchini pasta is one of the most common for both cold and hot pasta recipes, here are the instructions for how to make your own zucchini noodles. 3 ways to make Zucchini Noodles for pasta dishes! 1) The first way to make zucchini noodles is as shown in the picture above. Just clean your zucchini, spiralize, set on paper towel + lightly press another paper towel one on top to absorb moisture. Saute the zucchini noodles in a little olive oil and al dente (more firm than you would normally cook your zucchini, so the texture is like noodles). Keep the skins on for even more nutrients. 2) The second way to make zucchini pasta is to preheat the oven to 200 degrees while spiralizing your zucchini to make noodles. Absorb the moisture with paper towel and then grab a cookie sheet (more then one if you are making a lot of noodles because they need to lay in a flat single layer). Line your cookie sheet with paper towel, lay the zucchini noddles on it, lightly salt and then bake the raw zucchini in the oven for 20 to 30 minutes. You are "sweating" them or "dehydrating" per say. Once they are dried out you will cook them like normal noodles in boiling water with salt for 10-15 minutes. Drain and serve as planned. Some people do this in a microwave, but I think the oven is a healthier option, so I did not include the microwave version as a 4th way to make zucchini noodles. 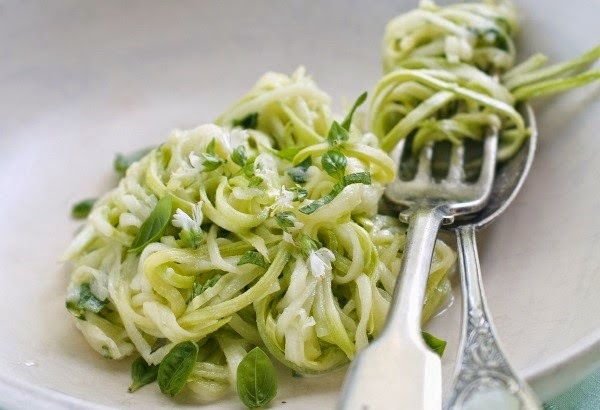 3) The third option is to spiralize the zucchini and absorb the moisture with paper towel (same as the other 2 ways to make zucchini noodles), but do not cook them at all. Eat them as raw noodles for pasta salad, raw food vegan sauces and dressings. Pasta is not the worst starch for you, but fresh vegetable noodles are the best! All three ways of making zucchini noodles are absolutely delicious and better for you then traditional noodles, but I want to point out one more thing that might make you feel better about noodles in general and in comparison to rice or potatoes ... Pasta is more slow burning. This means that they actually take longer to convert into starch / sugar in comparison to how rice and potatoes are used by your body. This should make you feel more comfortable when eating them especially if you choose whole grain or wheat noodles. On the other hand, in addition to making your own fresh vegetable noodles or zucchini noodles, there are AWESOME alternatives like low carb noodles, shirataki noodles, vegetable or quinoa pasta that can let you eat more freely. They are delicious pasta options, too! The truth of the matter is that making your own vegetable pasta (like the zucchini noodles) helps you get more fresh green vegetables into your diet and nothing can replace the benefits of that. Small changes like this can make a world of difference to your health as well as positively influence healthy lifestyle changes for those you love. This is my goal as a Skinny Fiber distributor. By all means, please use the product to lose weight if you need it, but my mission is to also inspire you to make the long term healthy lifestyle changes, so that you can lose weight naturally, become your healthiest, as well as an example for others. This is how we are going to combat the obesity epidemic throughout the world one person at a time. This is accomplished by educating ourselves, making the changes and becoming healthier as a whole.